Chacha is the Managing Partner at Oraro & Company Advocates and practices in the dispute resolution practice group. He specialises in arbitration, mediation, and litigation. With over 30 years of experience, Chacha has represented local and international clients in banking & commercial litigation, constitutional law, electoral law, employment & labour disputes, and property law. Chacha has been ranked by Chambers & Partners and Legal 500 for his expertise in employment and labour disputes. 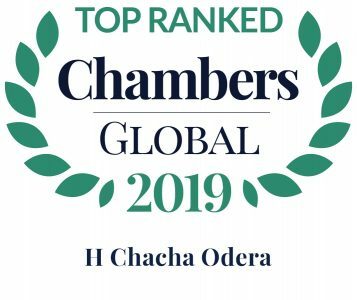 In 2019, The Chambers Global Guide lauded Chacha saying that he is an esteemed litigator noted for his activity in the employment courts "when things get very serious." Chacha has a Bachelor of Laws (LLB) from the University of Nairobi, Kenya and a Diploma in Law from the Kenya School of Law. In addition to being an Advocate of the High Court of Kenya, Chacha is a Commissioner for Oaths and Notary Public. Aside from his legal practice, Chacha is an adjunct lecturer at the Strathmore Law School; he has chaired two ad-hoc committees of the LSK namely, the committee for In-house Counsel and the Code of Conduct for lawyers. He has also served in various capacities in the Political Parties Disputes Tribunal and the Council of Legal of Education. Chacha is a passionate philanthropist and is currently an Honorary member of the Rotary Club of Milimani as well as a Paul Harris Fellow. He serves as a trustee of the Matibabu Foundation and Masada Trust. He is an esteemed litigator noted for his activity in the employment courts "when things get very serious." Advising the Kenya Deposit Insurance Corporation in the negotiations and recovery of depositor’s money from a debtor with an estimated value of USD 20 million. Acted for various commercial banks including Barclays Bank of Kenya, Central Bank of Kenya, Diamond Trust Bank, Housing Finance Company of Kenya, National Bank, Standard Chartered Bank. Providing legal advice to an international non-governmental organisation on the alleged unfair termination of contracts of employees on fixed-term contracts that were coming to an end. Representing an International Research Institute in a suit by three self-help groups claiming adverse possession over their land worth USD 44 million. Does your development require an environmental impact assessment license?